The pastor on Nat. Geo's "Snake Salvation" died Saturday night ... after one of the snakes to which he prays bit him. Pentecostal pastor Jamie Coots suffered the fatal attack while preaching to his Kentucky congregation. Emergency units raced to the church ... but the reality star had already left and gone home. 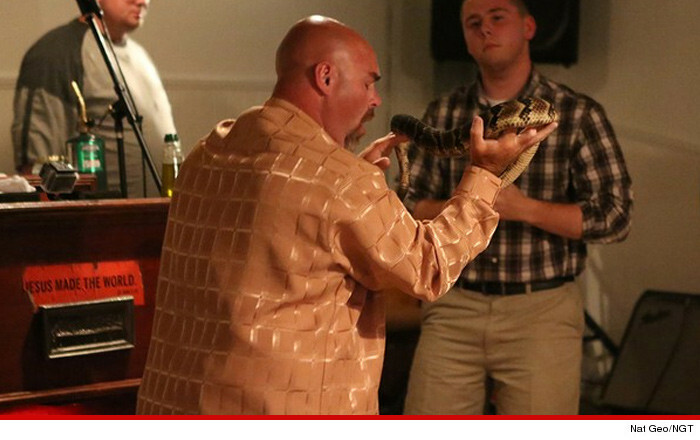 The show's website explains the Pastor and his followers believe the Bible says a poisonous snakebite will not harm them as long as they are anointed by God’s power. EMTs went to Coots' home but he sent them away ... refusing care ... an hour later he was dead. It's unclear if they were filming during the sermon. A rep for the show says the "Snake Salvation" finished filming last year ... and they never intended to film a second season. Jake the Snake -- I Lost 70 Lbs Doing Yoga & I'm Ready to Rumble!